It's hard to get bicyclists to agree on what they believe is the safest infrastructure. Some bicyclists want bike lanes everywhere and well-intentioned obliging road planners plot bike lanes next to parking spaces in downtowns like this one in Las Vegas. Other bicyclists want to bike just like they would if they drove a car. These "vehicular bicyclists" have a great point about unsafe bike lanes and biking in the traffic lane because putting in bike lanes right next to parking spots is a recipe for disaster -- namely, being doored and hitting the asphalt. Plus, cars routinely drive in bike lanes. Like here. Returned to the Las Vegas Cyclery Wednesday morning ride. First, we pop on the 215 trail. Plus, we bike into Calico Basin. And then we turn around at the Red Rock overlook on 159 and head for home. An added cyclist -- the mysterious "White Shirt Man" -- even joined the group on the way back. When I first saw Dennis Christopher, he was dressed in dark pants, a white long-sleeve shirt with a vest and Converse sneakers. 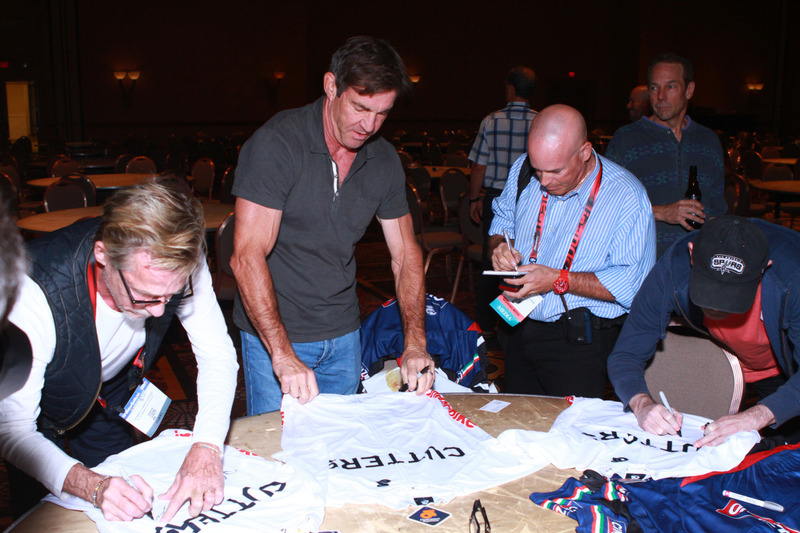 He was slim with a scruffy beard as he sauntered merrily into an empty ballroom at the Mandalay Bay Convention Center, where I was poised (and nervous) about interviewing him along with fellow actor pals Dennis Quaid and Jackie Earle Haley for their Breaking Away reunion at the Interbike trade show. For a mili-second, he looked like a fixie-riding hipster, who probably drank super hoppy IPAs. But that moment came and went quickly and the scenes of Christopher from 36 years ago came zooming back in my memory bank. He was not a hipster but a young man named Dave Stoller of Bloomington, Indiana, who shaved his legs, raced on a Masi and fell in love with a sorority co-ed at Indiana University. We quickly engaged in the interview I was doing for this story on the Breaking Away reunion for the Las Vegas Review-Journal. But the interview quickly morphed into a wonderful conversation between a reporter who returned to 1979 when the movie debuted and a lovely man who adored the opportunity to chat with strangers about their love affair with a movie that won an Academy Award for its screenplay writer, Steve Tesich, and a Golden Globe for best motion picture. I loved the way Christopher and Haley, who played pint-sized, long-haired, body-building Moocher, embraced and the genuine mutual affection between the two. Then Quaid walked in, and the hunky one gave Christopher a bear hug. The three easily chatted and talked like three 50-something buds catching up at a high school reunion. Christopher went on to appear in 40 big-screen and TV movies, but he's most known for playing Dave Stollar. I cover a lot of the movie's plot in the Review-Journal story, so I won't repeat it here. But Christopher said he loved playing Dave because of the subtle comedic lines and that the smorgasbord of sub-plots in the movies allowed viewers to pick and choose whatever story line resonated with them. There was the townie v university, son v father, local racer v Italian racers themes woven together with a subtle, humorous and clever touches. Christopher called it a throwback movie and said today's movies "jostle" the film-goer. I hope you enjoy the RJ story. Nothing like dudes rolling bicycles through Mandalay Bay's restaurant row. It's nice to see security not busting anyone's balls for having a bicycle inside a building. Great evening at the Interbike media product preview event on Tuesday. It's dusty. It's windy. It's toasty. It can only be Interbike's Outdoor Demo at Bootleg Canyon in Boulder City. The invasion of the bicycle people is happening in Las Vegas as the most special week is upon us -- Interbike Week. It's the national bicycle trade show. Or as I like to call it, The High Holy Days. The first two days are the dirt demo where bicycle lovers try out gorgeous mountain bikes and road bicycles at Bootleg Canyon in Boulder City and then it's at the Mandalay Bay Convention Center for the trade show Wednesday to Friday. And don't forget the famed World Cup CrossVegas bike race at Desert Breeze Park on Wednesday. and Customer Appreciation Day on Friday. You can tell the Interbike folks are in town because I saw a lot of new faces and bicycles on SR 159 in Red Rock Canyon this morning. When you see someone riding an urban commuter bike or a portable folding bike on the 159 shoulder, you know someone is exhibiting at Interbike. Speaking of Red Rock Canyon, there's nothing like missing it for a week to realize how beautiful it is. I'm back in town after a week visiting Great Basin and Yosemite National Parks, the east Sierras, Lake Tahoe and Mount Whitney and Red Rock Canyon can hold its own in the landscape looks department. I was biking on the scenic loop this morning and I still stare at the beauty of the The Big Red Stripe. So, the monster 1,500-mile two-state car trek has ended with a sojourn to Mount Whitney, and a drive through Death Valley back to Vegas. The bicycle came with me, and I cherry-picked some gorgeous rides up Wheeler Peak scenic drive at Great Basin, along US 50 in Austin, Nev., around Lake Tahoe and into the Sierras from Bishop. There were mini-side trips into Yosemite and up to Mount Whitney, the tallest peak in the lower 48 states. There was wildfire haze at Mammoth and Bishop along the US 395 corridor. But by the time I reached Lone Pine and drove nearly 5,000 feet in elevation to the Whitney Portal store and reached the trail, it was wonderfully and gloriously clear. Take a look for yourself. Then, it was off to Death Valley -- and then home. Below are some pretty Yosemite photos, which I took this afternoon after a full morning of biking 17 miles all up the mountain outside Bishop (about 60 miles south of Yosemite). But today's highlight was a 4:30 p.m. visit to the Petite Pantry restaurant on the outskirts of Bishop, based on a recommendation by Bruce the motel owner. It's the tale of the restaurant chairs. Besides serving a tasty sauteed carnitas dish with a scrumptious beef and vegetable soup and kickass salsa, owner Jay Jimenez has only reclining cushion office chairs at the restaurant on US 395. Here's Jay's son posing with the chairs. Jay came up with the office chair idea because he has customers who use wheelchairs, so he decided to have a worker meet the wheelchair customer out in the parking lot with the rolling office chair and then wheel them in for a meal. And to make the customer feel like the wheelchair is no issue, Jay has ALL the customers sit in the black, cushion office chairs. And that, my friends, is my Sierras story of the day. After a hectic day of bicycling around Lake Tahoe, I relaxed with the serene and quietness of the Sierras along the US 395 corridor from Carson City to Bishop. The landscape was a bit obscured by the smokey haze of wildfires. But I did find time to squeeze in a trio of bicycle rides -- a 22-miler in the Mono Basin National Forest Scenic Area, an easy 10-miler around Bishop and a 20-miler from Bishop to Big Pine and back. Here's a great view of California 120 about 10 miles east of US 395. I really like Bishop. It's an old-timey, throwback Sierra mountain city with retro motels, mom-and-pop stores on Main Street and a touch of funk. There's a JC Penney store on Main Street -- you don't see that anymore. The local grocery is Bi Rite and it's also on the main drag a block from the main intersection in Bishop. A world-famous bakery called Erick Schat's Bakkery is another Maon Street anchor. And I thought this photo was a fun -- here's an art gallery and a book shop next to a meat market and a gun/ammo store. The police station had a mural that paid homage to the good ol' days of the West..
And I grabbed a burger at this joint. Check out the drive through action at the Burger Barn. The friendly motel manager, Bruce, a retired California Highway trooper showed me the collection of foreign coins donated by his many international guests. More than 35 different national coins are on display in the office, with one Vietnamese guest leaving a paper bill since she didn't have a coin. If you're in Bishop, stay at this place. Today I had a first date with cycling around Lake Tahoe, a stunning beauty of a mountain lake in Nevada and California. It was a 75.04-mile roller-coaster of a memorable ride with elevation gain of 4,225 feet. But bicycling, for me, is about emotions, aesthetics and inspiration. And the Lake Tahoe ride was about The Good, The Bad and The Ugly. I had mixed emotions about the Lake Tahoe ride. It was like going out on a first date with a beautiful woman with some issues. Let's face it -- Lake Tahoe is a watery looker amid amazing pines and the rugged Sierras. The vistas are spectacular. It's the ultimate sky lake. And because the route is a roller-coaster, I saw the lake from different angles. Emerald Bay was mesmerizing, and California 89 was a rugged, twisty road that forced me to grind out challenging climbs with a hairpin turn thrown in. But it was worth it to see the inlet off the lake with the appropriate name..
And amid all this natural beauty, I met Pete, who was celebrating his 77th birthday with a 32-mile bike ride with 37 other senior cyclists. Hell, I know it was the day after a Monday holiday. But the traffic and cars took a lot away from the bicycle experience. I realize Lake Tahoe is an amazing natural resource and everyone wants to see a piece of it. But there were so many cars going so fast. I started on U.S. 50, which is a four-lane road with cars and trucks whizzing by my left shoulder going 60 mph. The shoulder on U.S. 50 came and went, the vehicles were going so fast at 65 mph that it was unsafe for me to take a lane when cars and trucks fly at those speeds. The road conditions were a mixed bag on California 89 and 28, the roads that went around the lake. Sometimes there were nice bike lanes. Sometime, no bike lanes. And I was surprised the speed limit on this narrow, two-lane road was 55 mph. Every time I would soak up a gorgeous natural scene it was blown up by three or four cars and trucks whizzing by my left shoulder at high speeds. On the lake's west side, there was a paved off-road trail that inexperienced and casual bicyclists were using. But it must have crossed the road a half-dozen times as it meandered its way along the road. Most of the small villages along the lake route were pleasant. Tahoma, Tahoe City and Kings Beach come to mind. But the monstrosity of South Lake Tahoe, an overbuilt, suburby-style city that began with giant casinos like Harrahs at the Nevada-California border that were completely out of scale for beautiful Lake Tahoe. All the commercial development and all the cars were a jolt and seemed so out of place. I found South Lake Tahoe weird, too. Check out this bicyclist coming right at me in salmon-fashion. Lake Tahoe is so gorgeous and majestic that big casinos and sprawl-like commercial development are no way to respect this mountain gem.